256GB Micro SD Card - Class10, SDXC Memory SD TF Card Brand New. Condition is New. Shipped with USPS First Class Package. New Genuine Sealed Samsung Evo Plus 256GB Micro SD Card Class 10 SDXC Memory. Condition is New. Shipped with USPS First Class Package. 256gb Samsung Micro SDXC Card with SD card adapter included. Typically we have one hit wonders and the product listed is the actual product you will receive. Lexar 256gb micro sd Free Shipping. Condition is New. Free shipping to lower 48. Thanks for looking. Storage Capacity 2x 128GB. Manufacturer SCT. Format Type SD XC. SD XC 16GB. SD XC 32GB. SoCal Trade, Inc. Do not copy without permission. Speed Performance Class 10 UHS-1. Lexar 256gb micro sd high performance 633x microSDXC 95MB/s. Condition is New. Shipped with USPS First Class Package. 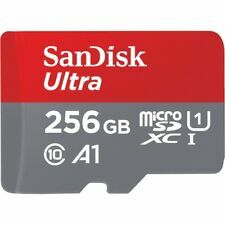 SanDisk Ultra 256GB Class 10 Micro SD XC UHS-I Memory Card with Adapter SALE! The SanDisk Ultra microSDXC UHS-I card is perfect for recording and watching Full HD video, with room for even more hours of video. Fast transfer speeds ensure, that you can move all your content blazingly fast. Ideal for smartphones and tablets, this card's A1 rating means, that you can load apps faster too. Perfect for use with Nintendo Switch, GoPro Cameras, Android phones and more. Brand new micro sdxc evo plus car of 256 GB. It is water proof. Magnet proof. Temperature proof. X-ray proof. With a 10 year limited warranty. Samsung 256GB Micro SD SDXC MicroSD MicroSDXC Class 10 100MB/s EVO Plus. Storage Capacity: 256GB. Caution remarks on "waterproof". 1 x StandardSanDisk SD Adapter. 6: Indicates reading and writing speeds based on SD Association specifications. Trending at $58.91eBay determines this price through a machine learned model of the product's sale prices within the last 90 days. sd card 256gb microSDXC UHS-I Card evo plus. Condition is New. Shipped with USPS First Class Package. You Are Buying A New Micro SD Card 256gb..Box 94..
100% 256GB Huge Storage Real Capacity. Expand your smartphone or PDA capabilities with more space to get the job done! Will hold thousands of images or songs! ● 4 kinds of storage capacities ( 32GB / 64GB / 128GB / 256GB ). Support 4K Video Recording: Yes. ● High speed data read ( 45MB / s ) for instant viewing and transfer. Format SDXC. Type MicroSD(TF). Family Line Evo. Weight 12g. Moreover, the Elite series is immune to airport X-rays so there is no need to worry when travelling overseas. The Elite microSD Series is backed by 5-year warranty. UHS-1 Class 10 specifications, enabling fast file transfer speeds and Full-HD video recording. Lexar 256gb micro sd. Condition is New. Shipped with USPS First Class Package. 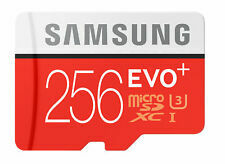 256GB Micro SD for Android-based smartphones and tablets. Class 10 for full HD video recording and Playback. Waterproof, shockproof, Temperature-proof, magnet-proof & x-ray proof. 256GB SD cards have enough space to store hundreds of photos and many hours of video that you might take with your digital camera. They're a great way to keep these files safe or link them with other devices for viewing and printing. eBay carries several 256GB SD cards that will suit a variety of needs. How do the different SD card speed classes work? Class 10 - This class can write at speeds of up to 10 megabytes each second. UHS Class 1 - This class starts at speeds of 10 megabytes per second and can go higher from there. Can you choose a 256GB SD card brand? How can you back up files on your 256GB card? If your 256 SD card is full and you don't want to delete any of the photos or videos you've taken, you can back those up to another device first. One of the easiest ways to do this is to insert the card into the appropriate slot on your laptop or PC. Once it is inside, the computer should recognize the card and open a window where you can view all the files on it. If you copy the files from the card to a directory on the computer, you can safely delete them from the card to free up space for more photos and videos. Make sure the files have finished copying over to the new device before deleting them from the card.